If you’re headed to Boracay this summer, here’s a guide that I hope would help you in planning your trip. Before December, I’ve always thought that the cheap accommodations in Boracay were all at Station 3. I was so glad to find out that there are reasonably priced rooms in Station 2, and near D’mall too! Obviously, this map is not to scale. 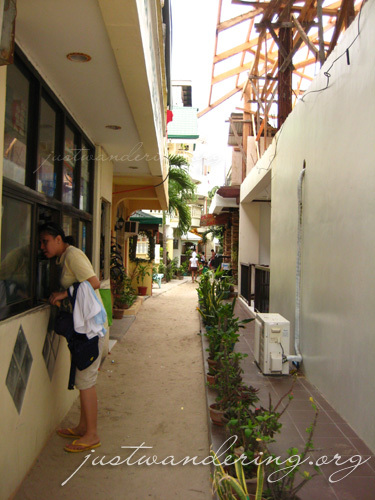 If you’ve been to Boracay before, you would probably be able to gauge the location of this alley. If you’re a first timer, don’t fret! I’ll be giving directions on how to go there, and a list of the resort’s contact numbers. 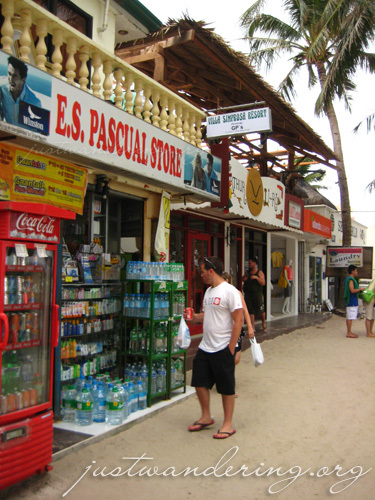 From the jetty port in Cagban (Boracay Island), ride a tricycle to D’mall. The driver will drop you off across the entrance. Head down the path between Julie’s Bakeshop and Budget Mart. You’ll come upon the Ferris wheel. Continue down the path between Lemon Cafe and Cindy’s, going on until you’re at the main beach road, between Aria and Cafe del Sol. And there you have it! You’re in a place where you can get rooms for as low as Php 1,000 in the lean season (or even during regular seasons if you get a discount). Save for Sheena’s resort, all the accommodations in this alley are very affordable (Sheena’s rooms start at Php 3,000 per night for two). In 00:03 you can see the staircase of Jerome Bungalow in between the pillars, in 00:04 you see Eriko’s House, 00:05 is Madid’s Inn and at 00:06 Jejsellends is at the right. At 00:12, see the palm tree? That’s Villa Simprosa, right across Taj Guesthouse, which starts at 00:15. At 00:26, the guy at the right is inquiring at Sheena’s reception desk, while across it, at 00:27 is Namaste. At 00:32, you can see a reception desk for Villa Simprosa at the ES Pascual Store. At 00:37 is the beach road and at 00:42 is Sheena’s Resort and Restaurant’s beach front. On the left of that is Tans Grill, which only opens at night. The beach proper starts at 00:52. 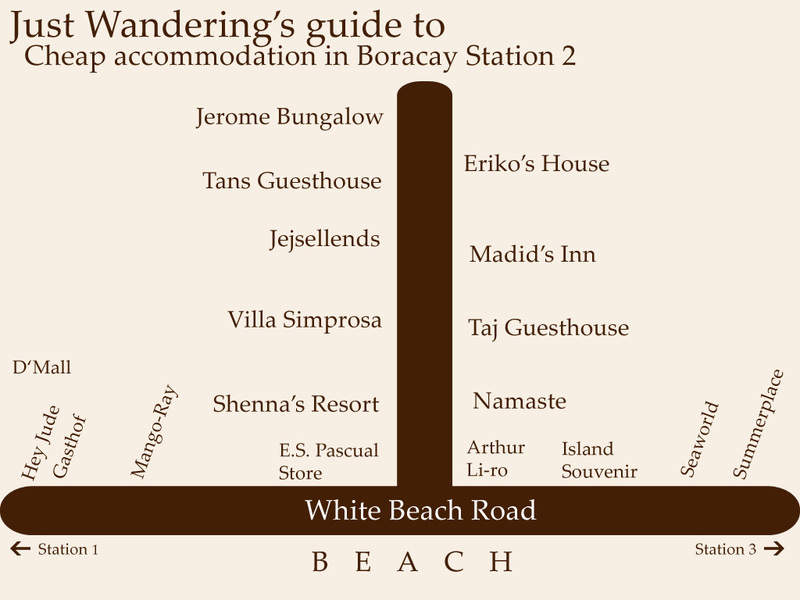 I hope this helps you in picking out where to stay in Boracay. Have a nice trip! 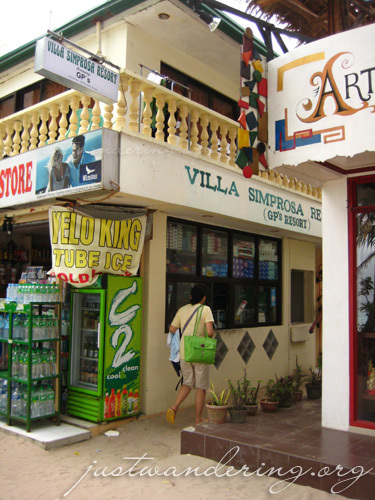 looking for a cheap/nice place to stay in bora. Thank you so much. We used this for our family vacation in bora and its perfect. Hey thanks for this, it’s a lot of help! this was a great help. stayed at eriko’s twice, and will be there for the third time. i hope they’d give me a discount being their “suki”, hahaha! and i’m in charge of our accommodation. ang hirap maghanap ng mura pero maganda yung location. good thing i saw this blog. This is cool, many people today is looking for affordable place to stay even in a resort like this. Nice…very helpful lalo na sa mga naghahanap ng budget hotel sa boracay. Hi, Just want to ask if you have rates for 2012. I am planning to go with my wife in Boracay on November. definitely very USEFUL info. hehe. thank you! This is so so helpful and something I’ll keep in mind for my next trip to Boracay! Thanks so much. This helps a lot in our family vacay in Bora. thanks for this site. It’s complete with phone numbers and addresses. Such a big help. More power! I made this list way back in 2009, so there might be price increases or change in the contact numbers. Still, glad you found it useful! Your blog was very helpful! Keep it up! this was posted in 2009 but still very useful. cannot view the video that you post how can i watched it..i stayed before at namaste 2008 but was confused now because the have lots of buildings same name as them been planning to come back this feb with my family so it will be a big help if i can watch your video so i’ll remember which namaste i stayed before tnx..